The bottle cap technology was invented in 1892 when William Painter, who was in the beverage industry, was searching for a better way to package products. The bottle cap has been around ever since and is popular among collectors and bottled beverage lovers alike. However, this everyday item isn’t just reserved for the display box. Their durable, colorful quality makes them the perfect go to material for do it yourself projects. Bottle caps often come with an already printed or colorful display, but they can also be primed and painted to achieve any hue. 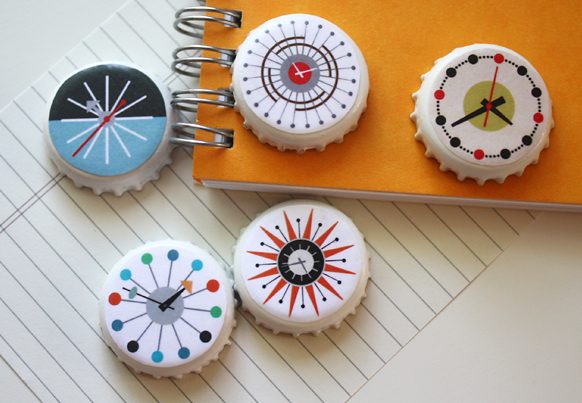 One super easy idea to incorporate caps throughout the house are by turning them into magnets. Check out these free downloads from How About Orange for some mid-century modern design appliques. Another simple idea is to use bottle caps as a textured surface. The can be inlaid on trays, tables and used as a backsplash instead of tiles to brighten up a plain surface. This tray was given a new look by giving the caps an acrylic water bath. A time consuming process, but worth the effort if you have a table that needs resurfaced. You won’t have to worry about dents, water rings or stains on this table. If damaged flooring needs to be replaced, but a strict budget doesn’t lend to the repair, try a floor mosaic. Maybe not ideal for the tender footed, but perfect for entryways or high traffic areas. These can also be hung as decorative wall panels. Hard to believe that bottle caps can be glammed up, but this example of a lamp fitted with a uniform paint application turns the caps into a one of a kind shade. Though this one is done with plastic lids the same idea can be done with other types of bottle caps. With imagination, craftiness and a need to resurface the once plain, everyday objects like bottle caps can be upcycled into many unique projects.